This picture was on the front page of today's Drudge Report. 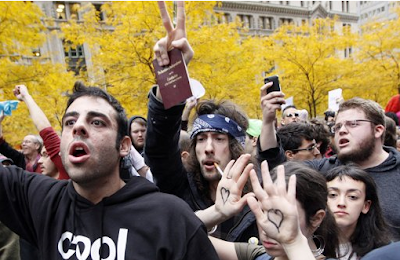 Do any of you who are constantly badmouthing the entire Occupy Movement recognize what the scruffy guy in the blue bandanna has in his hand. I'll give you a small hint. It's a copy of the CATO US Constitution. Maybe you're familiar with it. If not maybe you should get one and check out Pg 43!